Hello – we have the terrific news that we – with your help – SOLD OUT of the Fall Raffle before the Draw today, Friday, January 11, 2019 at Noon! This tremendous amount of support will raise well over $14,000 for Camp K this Summer! Tickets are NOW available for our Annual Fall Fundraising Raffle! After many weeks of gathering quality prizes, we can proudly offer them for sale. The prizes are fabulous! As we are getting started somewhat late…we will need LOTS of help to sell out of our 7,000 tickets before the draw on Jan 11. I hope everyone can join me in trying to make this year a sell-out!! Unsold tickets represent lost Fundraising $'s for Children at Risk. Funds raised will support our Community-Based Special Projects. Tickets $3 each, 2 for $5 or a book of 10 for $20! Funds raised will go towards our summer day camp, Camp Kaleidoscope, in 2019! This valuable support receives no government funding and is financed solely through Fundraising efforts and Donations. Raffle will be drawn Friday, January 11, 2019. 12 Drawas with Prizes worth a total of $9,799! Please try to return ticket stubs and monies by Wednesday, January 9th, as our draw is on the 11th! 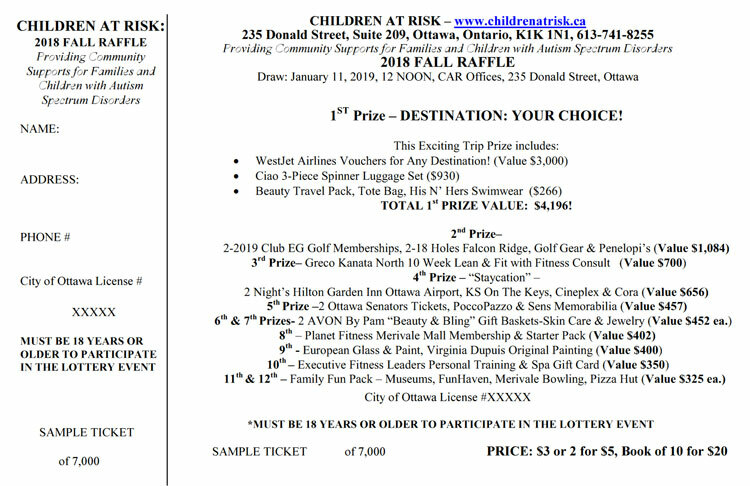 If you require more tickets contact our offices at 613-741-8255, or by email, car@childrenatrisk.ca, and we can cheerfully send them out to you! We would only need for each family to sell 2 books, would sell out!